This set is made with recolour, retexture and resizing scripts. 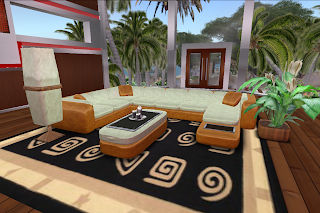 Some items have up to 3 different groups to retexture so you can texture the cushion , seats and base in different colors. It also has the option to choose between at least 5 poses on each seat, simply by clicking the cushion you sit on. The table also has 5 different poses which are quite fun. 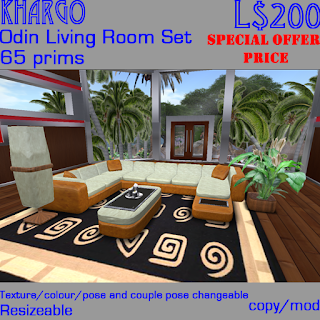 - 3 groups to retexture/ recolor (base, seats and cushions. 43 textures available for each group). - 7 spot to sit, 5 single spots and 1 couple, every spot has 5 different animations. - 2 groups to retexture/recolor( 43 textures for both groups). We are also hoping to have our camping chairs working soon.